To make the batter, whisk the flour, eggs, salt and half the milk together in a mixing bowl until smooth. Add the butter and enough of the remaining milk to achieve a thin, pouring-cream consistency. Leave to stand for 30 minutes. To make the béchamel sauce, melt the butter in a solid-bottomed saucepan and stir in the flour. Gently cook the butter and flour together for a minute or two, but on no account allow it to colour. Add the milk all at once and whisk together with vigour, until smooth. Season. On a low heat (preferably using a heat-diffuser pad), set the sauce to cook, which will soon enough become silky smooth. Stir, fairly constantly, using a wooden spoon and cook for about 15-20 minutes. Now, switch off the heat and cover with a tight-fitting lid, which will help to prevent a skin forming. Keep warm, suspended over a pan of hot water. Pre-heat the oven to 200˚C/gas mark 6. For the filling, blanch the spinach in boiling water for a couple of minutes. Drain and refresh under very cold running water, then squeeze in a tea towel until completely dry. Purée the spinach, ricotta, egg yolks, Parmesan, seasoning and nutmeg. Spread out onto a shallow tray, cover with clingfilm and put in the fridge to firm up. To complete the dish, place two tablespoons of the filling on each pancake and roll up, tucking in the ends if necessary. Lay in a lightly buttered baking dish, with a small space in between each one, then carefully spoon the sauce over. Sprinkle the Parmesan on top and bake in the oven for 25-30 minutes, or until bubbling well and golden on the surface. Hand around extra Parmesan at table, if you wish. Put the chicken in a large pot, add the vegetables, herbs, cloves and salt. Poach very gently for about an hour, skimming off any scum that settles on the surface. Once cooked, lift out the bird and allow to cool. Strain the stock through a fine sieve and discard all solids. Leave to settle and remove all surface fat using kitchen paper. Remove all meat from the chicken carcase (discard skin and bones), then tear into large pieces. Pre-heat the oven to 200˚C/gas mark 6. To make the sauce, melt the butter in a pan, stir in the flour and cook for a couple of minutes, stirring. Gradually add the chicken stock, white wine and cream and whisk together until thickened. Stir in the cheese and tarragon, correct the seasoning and simmer together for about 20 minutes. Only now should you stir in the mustard. 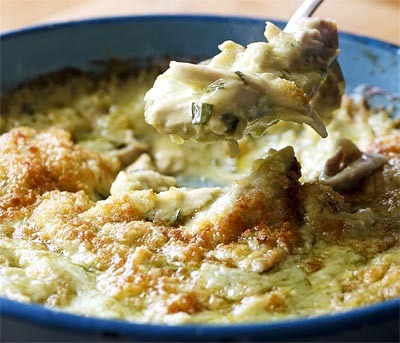 Put the chicken in a lightly buttered, shallow baking dish, pour the sauce over and loosely mix chicken and sauce together, then sprinkle with the breadcrumbs and Parmesan cheese. Bake in the oven for 30-35 minutes until the dish is golden brown and bubbling well around the edges. Finish under a moderate grill if the surface isn’t burnished enough. Eat with crisp green leaves (cos lettuce hearts would be my choice), lightly dressed.